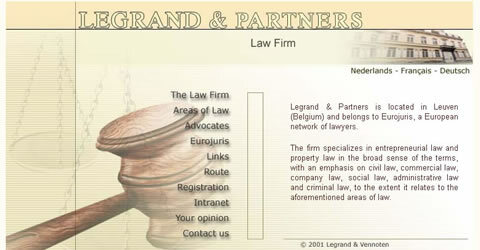 Our offices are located at 19 Park Avenue in Desainagar, in the beautiful kwaZulu Natal Province. Coming from Durban, you go North, direction Stanger on either the M4 or the N2. 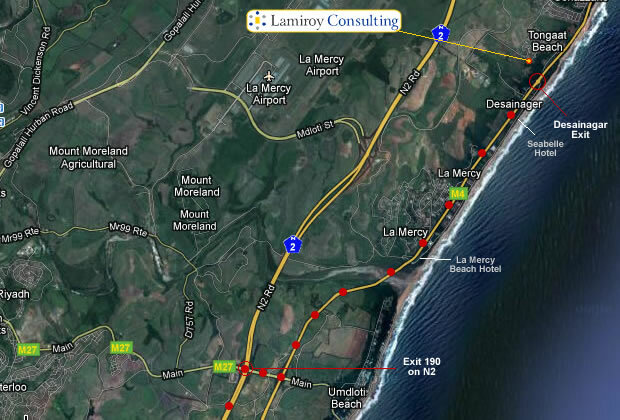 (If you're coming from the new La Mercy Airport, take direction 'Durban' on the N2). If you're on the N2, take the Umdloti exit (i.e. Exit 190) to get onto the M4. 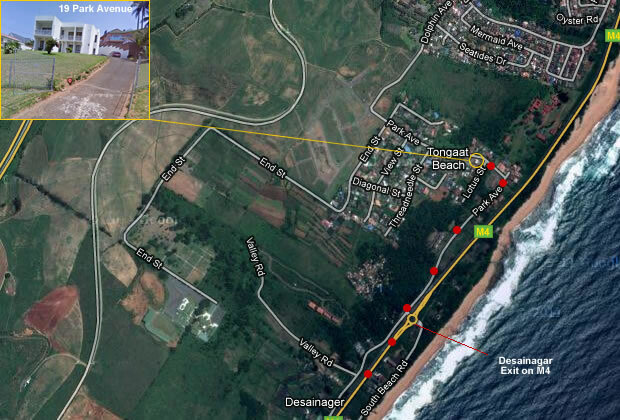 (To reach Exit 190 on the N2, you have to pass Umhlanga Rocks, as well as the Sibaya Casino). Desainagar and Park Avenue have their own exit on the M4. It is approx. 4 km away from the La Mercy Beach Lagoon and the Odloti river. You'll find the "Desainagar / Park Ave" exit on your left. When you take the Desainagar exit, you instantly have to turn right, at which point you are already in Park Avenue. Initially Park Avenue stays parallel to the M4. When you reach a small shopping center on the left (with a Remax Office), the road turns to the left, uphill. While driving uphill, 19 Park Avenue is the second house on the left, just past Lotus Street. It is the only house on the left with a metal fence. (The other houses have walls). Note that Google erroneously spells Desainagar with an 'e', and doesn't realize Desainagar and Tongaat beach are the same.